You'll be £19.99 closer to your next £10.00 credit when you purchase Battle on the Aisne 1914. What's this? The River Aisne featured prominently in August 1914 during the Retreat from Mons. A month later it was the scene of further desperate action when the British Expeditionary Force re-crossed it in their unsuccessful attempt to dislodge the German Army entrenched along the crest of the slopes on its northern bank. Having already fought three major engagements and marched over 200 miles in a month, the battle proved hugely costly to the BEF. Indeed the three British Corps suffered losses of over 650 officers and some 12,000 men killed. These figures shocked the Nation which was faced for the first time with such grievous fatalities. Little wonder one officer wrote that he felt he was 'in the company of ghosts'. rightful context, both from the BEF and German viewpoints. In this detailed analysis he identifies the early deficiencies and lack of preparedness of the British Army staff and logistics organisation as well as friction among those within the command structure, all of which hampered effective operations. 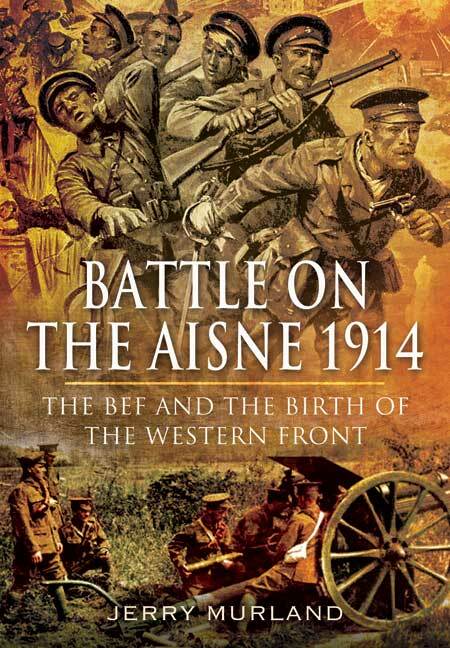 I am not usually an enthusiast of detailed battle accounts but the author blends the fine detail with interesting overviews of the BEF's journey to the Aisne, the immediate aftermath of the battle and insights into artillery and air tactics. Consideration of the experiences of prisioners of war adds a further engaging dimension. Throughout there is skillful and and often moving use of unit war diaries and personal diaries and accounts. The appendices on the order of Battle of the BEF in September 1914 and the 16 cemeteries north and south of the Aisne add to the picture. The depth of research, self- evident as it is in the text, is reinforced by the extensive notes and bibliography. An excellent book. A concise, yet highly informative book. The provides a detailed analysis in his own words. AS ever I enjoyed the personal accounts which are skilfully woven into the text and particularly liked the battle-cry of the Northamptonshire counter-attacking on 17 September; ‘come on the Cobblers!’ I found the selection of pictures excellent. Jerry Murland's book very vividly reminds us of the beginning of the conflict, when it was a war of maneuver, and focuses on the September 1914 battles on the River Aisne. Using a plethora of primary sources from both sides, Murland brings this story to life. This book is a continuation of Jerry Murland's previous work on Mons and the Great Retreat. As such the opening introduction is a clear review of 'events so far'. The Battle of the Aisne is a fascinating and dramatic passage of arms but Murland takes care to point out that the BEF was a very minor player in the bigger picture. Having said that this book tracks the BEF in a story that includes moments of dramatic excitement that match fiction. Whether it is whole brigades teetering across single plank bridges above the swirling Aisne, or the desperate struggles of the sappers to create pontoon bridges, there is plenty to stir the blood. The book does not fail to address the failure of Sir John French and GHQ to spur the BEF forward with sufficient urgency in the advance from the Marne. In truth French did not understand the situation, failing to have any real inkling of the opportunities that may - or may not - have briefly existed to seize the Chemin de Dames heights before the Germans had brought up reserves and consolidated their defensive grip - and the door was slammed shut in the faces of the BEF. The confused fighting raging on the spurs running down from the main ridge gave copious opportunities for German flanking fire and the overall superiority of their artillery causing heavy British casualties. Some of the fighting was savage with both sides occasionally transgressing the accepted rules of war in 'white flag' incidents. Then as the front line froze in aspic, so trench warfare began to make its appearance. Everything was new, everything had to be learnt from scratch. The advent of the 'Jack Johnsons' and 'Black Marias' - large shells crashing down on the lines - certainly caused much comment. It was impossible to imagine that such things would have to be endured for years. Murland also includes useful chapters reviewing the challenges faced and advances made by both the Royal Artillery and Royal Flying Corps. They were already making cutting-edge advances in photo reconnaissance and wireless artillery observation above the Aisne in September 1914, advances which gave an inkling of the future - at least when there were sufficient guns, shells, trained gunners, aircraft and air crew! The maps are adequate, although - as is so often the case - economies inflicted by publishers have had an impact on the amount of detail that can be presented but I found the selection of pictures excellent. This engaging work covers the little known abortive counterattack mounted by the British Expeditionary Force (BEF) immediately after the gruelling retreat from Mons in August 1914. Jerry Murland, a noted authority on the early pre-trench-warfare campaigns of the Great War, has produced a detailed analysis of this battle both from the British and German standpoints. This book has a small but apposite collection of excellent photographs, a good selection of maps, and a very detailed BEF order of battle down to battalion level, as well as a comprehensive appendix that describes the 26 Aisne cemeteries. It comes highly recommended to anyone interested in the story of how the BEF endured its baptism of fire before the attrition of trench warfare set in. The author's narrative is clear, easy to read and engaging...the stories, quotes and anecdotes bring life to the proceedings and reveal weaknesses in British structure, tactics and command. There are a number of simple and clear maps to help navigate what for some readers will be new territory (which, by the way, is well worth a visit) and a good selection of photographs by way of illustration. Well worth a read.